Democratic Candidate for United States Senator from Virginia. 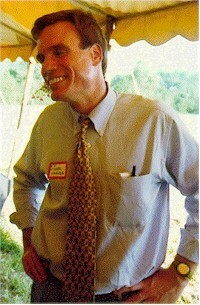 Picture of Mark Warner taken Panorama Farms, Earlysville, Virginia, May 19, 1996. Mark Warner is the founder and managing director of Columbia Capital Corporation, a leading mergers and acquistions firm specializing in wireless communications. Mark has enjoyed extraordinary success in business, and in national and community affairs. His ability to get things done and his vision for the future made the U.S. Senate race one that is being watched around the country. Julian Bond was there? Emily Couric was there. Rod Slayton was there. 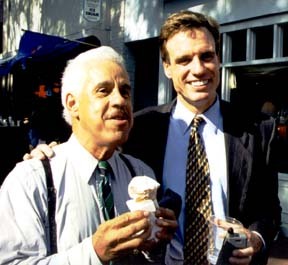 Mark Warner was there. Doug Wilder was there. Where, oh where, was Virgil Goode? Sorry that I had to miss the rally on Wednesday. I had been in Charlottesville on Monday morning then again on Tuesday to visit GE and Sperry and meet with employees there. I had the rally scheduled for Saturday and had planned to attend but when Mark needed to move it to Wednesday I couldn't change a longstanding commitment in Danville. We had a great crowd this morning (October 31, 1996) in Martinsville for Mark and myself - probably 150. We'll hold up our end down here and are counting on you to do the same! Thanks again for all of your help. "'Our vision is a bright and prosperous future with a place at the table for every American' ... The vision of John Warner and GOP presidential nominee Bob Dole 'is a desparate longing for the past, where the table is reserved seating only ... We cannot go back to the days when economic security meant you were securely rooted in your poverty' ... Virginians would win with a Mark Warner victory" (Julian Bond, quoted by Bob Gibson in the Daily Progress, October 31, 1996). In Virginia (CBS News, Campaign 96, State by State, November 6, 1996): SENATE (99% Precincts Reporting): Mark Warner (D) 1,098,440/47%; John Warner (R) 1,221,508/53%. In Charlottesville ( Unofficial results, Daily Progress, November 6, 1996): SENATE: Mark Warner (D) 7,424; John Warner (R) 5,255. "Mark Warner wound up spending $8.96 of his own money for every one of his 1,115,983 votes. The incumubent (John Warner) 's campaign spent $4 per vote, garnering 1,235,744 votes" (The Washington Post, December 6, 1996). Ah, the power of incumbency!